The postal service’s unofficial motto of “Neither snow nor rain nor heat nor gloom of night stays these couriers from the swift completion of their appointed rounds” would need a special addition on the Pacific island nation of Vanuatu. Diving about 10 feet underwater! 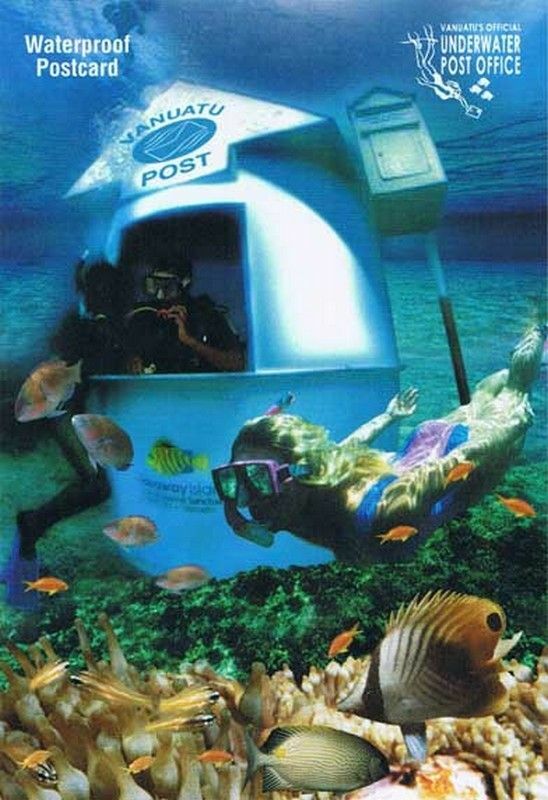 The Vanuatu Underwater Post Office, opened in 2003, is the world’s first underwater post office that makes it possible for you to send postcards back home from under the sea. Swim or snorkel from the beach at the Hideaway Island Marine Sanctuary, and post your special waterproof postcard and stamp in the mailbox. Note that the post office had to develop an embossed cancellation device since ink would smear in the water. After you’ve mailed your postcard, enjoy the colorful coral gardens and the multitude of tropical fish swimming nearby in the clear waters of this diver’s mecca! Editor’s Top Finds of 2015: Escaping the Cold Weather!